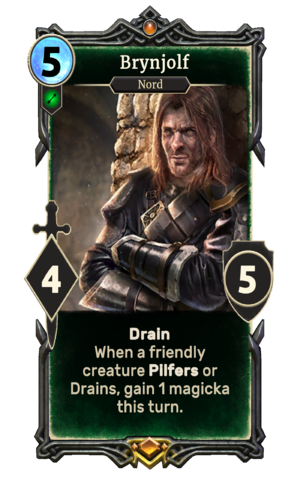 Brynjolf is a unique legendary Agility creature card. It is part of the Heroes of Skyrim expansion. In addition to the card's availability in the Heroes of Skyrim expansion, one copy is included in the Brynjolf's Heist theme deck. "Shall we put in a dishonest day's work?" "I can smell your fear." Brynjolf first appeared in Skyrim. This page was last modified on 27 February 2019, at 00:55.